SPEECH contests are a Toastmasters tradition. This is no exception for the Toastmasters clubs in Brunei Darussalam. 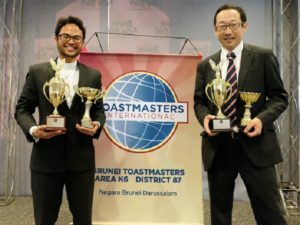 The chartered Brunei clubs are represented by the Brunei Speakers’ Club (BSC), Brunei Advanced Speakers Club (BASC), OTTERS TMC and UBD Toastmasters Club (UBD TMC). These clubs are listed under Area K6, Division K of District 87 of Toastmasters International. BSC held its annual Club Humorous Speech and Speech Evaluation Contests at Sameo-Voctech in Gadong in September. Representatives from each of the four charted Brunei clubs were sent to contest at the area level, which is equivalent to contesting on the national stage. The area contest was held at Progresif Cellular’s headquarter at Jalan Pasar Baharu in Gadong. Ichiro Otani, a Japanese currently based in Brunei and a member of OTTERS TMC, won first place in the Area Humourous Speech Contest. Rahmat bin Tarsat of BSC and BSC Secretary Hajah Haryati binti Haji Abdul Gafur were placed second and third. In the Area Speech Evaluation Contest, Hazwan Kamarulzaman of BSC, Allen Ang of BASC and Liyana Sidek of UBD TMC, were placed first, second and third respectively. 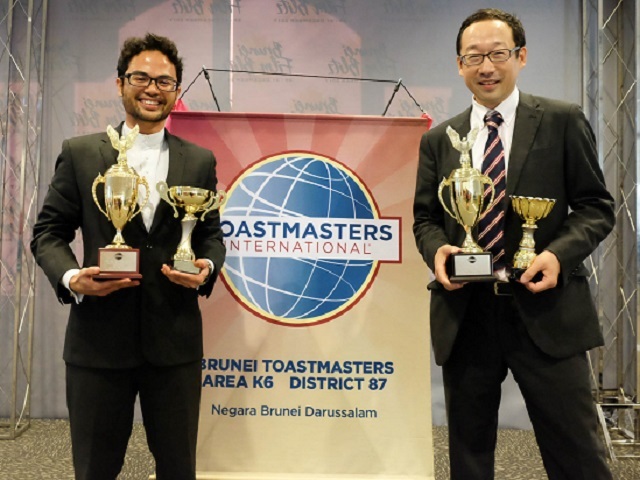 Allen Ang later continued to contest at the division level in which Toastmasters clubs in Brunei, Sabah and Labuan compete. Division K is the largest division in District 87, consisting 32 clubs organised into seven areas. Allen Ang won second place in the Division Speech Evaluation Contest. The public is welcome to join the Area K6 Toastmasters Club.